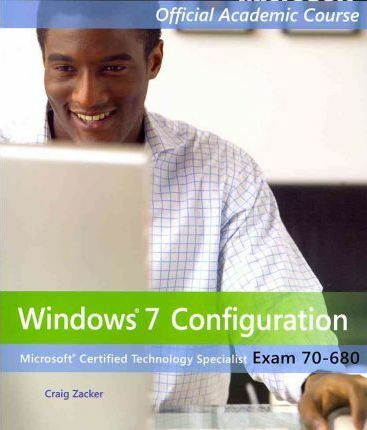 This book is for users preparing to become certified for the 70-680 Windows 7 Configuration exam. The Microsoft Official Academic Course (MOAC) lessons correlate and are mapped to the Microsoft Certified Technology Specialist (MCTS) 70-680 certification exam. This book includes installing, deployment, and upgrade to Windows 7. The text also covers new Windows 7 features such as BranchCache and HomeGroup networking. Additionally, you will master configuration pre-installation and post-installation system settings, Windows security features, network connectivity applications included with Windows 7, and mobile computing. The MOAC IT Professional series is the Official from Microsoft, turn-key Workforce training program that leads to professional certification. With the Microsoft Official Academic course program, you are getting instructional support from Microsoft; materials that are current, accurate, and technologically innovative. The Microsoft Official Academic Course series is a complete program for instructors and institutions to prepare and deliver great courses on Microsoft software technologies. With MOAC, we recognize that, because of the rapid pace of change in the technology and curriculum developed by Microsoft, there is an ongoing set of needs beyond classroom instruction tools for an instructor to be ready to teach the course. MOAC endeavors to provide solutions for all these needs in a systematic manner in order to ensure a successful and rewarding course experience for both instructor and student--technical and curriculum training for instructor readiness with new software releases, the software itself for student use at home for building hands-on skills, assessment and validation of skill development, and a great set of tools for delivering instruction in the classroom and lab. All are important to the smooth delivery of an interesting course on Microsoft software, and all are provided with the Microsoft Official Academic Course program.